Okay y'all, I was in the Dollar Tree a couple days ago and found some awesome stuff. But before we get to that can I just say that I'm loving Dollar Tree? OK, I know I've said that before but each time I go it gets better and better. They are blowing my mind with all the things they can sell for a dollar!! Now days I can't go in there and not come out with a bagful of things. It's just like Target, go in for soap and come out with everything you don't need! Most of these pictures were taken at night so please excuse the harsh lighting. Contact paper with a beautiful design on it. The light bulb in my head went off and I knew I had to have it for a project I've been wanting to do. 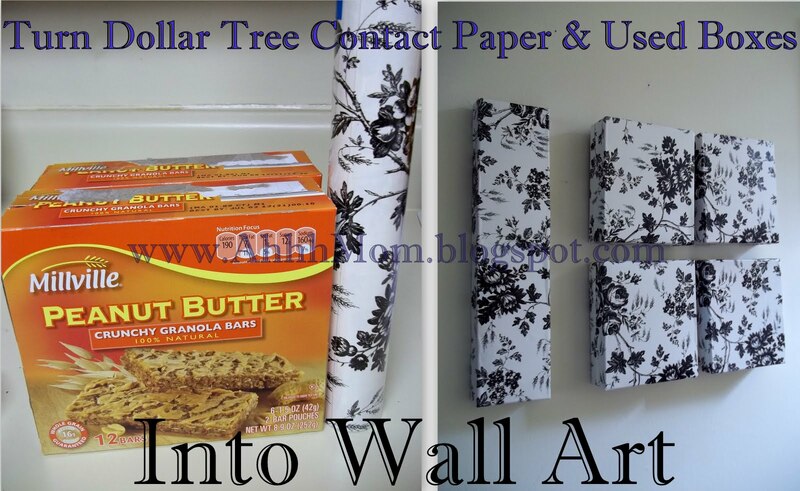 This is how you make wall art using Dollar Tree Contact Paper and some used boxes. Since I have a slight hoarding problem and a love for boxes I will save boxes because I know I can find a good use for them. And now I have! The first thing you need to do is tape up any open parts of your box. Next I spray painted the front of my boxes white so that you wouldn't see the lettering popping through. I only did this because my Contact paper was a light color. If you have a darker color you may not need to do it. All you are going to do is cut your Contact paper down to size so that you can 'wrap' your boxes. Don't worry if you have some places showing. All you need to do is cut a little piece and fill it in. Wrap all of your boxes and voila! All I did was find the middle of my box and slice a little hole in it with my scissors so that I could hang it on a nail in my wall. Then you are ready to hang!! Love these!! After I made these I decided to go a little further and fill in the blank spot next to them. So I used 2 Mac n Cheese boxes taped together. I'm not sure if I like the Mac n Cheese one. I'm still thinking I may just wait to have 2 more of the Granola boxes and just have 6 of the same size boxes. But overall, I love it! Now you can have toilet paper rolls and old boxes hanging on your walls. YOU ARE WELCOME. I like it....the mac and cheese looks good too, it gives it substance. gonna have to do some! Thanks Momma! I have boxes if you need some! Did you make the pretty blue jar in one of the pics? No, I bought that from the Goodwill for 2.99 I think. No way!! Awesome! And yes the Dollar Tree is heaven. try moving the mac and cheese box a little closer to the other four so the gaps between the boxes is the same distance. Then it will look like it is part of the display more. Great Idea! I bought a bunch of this paper I will have to give this a try .. Brilliant! Looks like I need to make a trip to my Dollar Tree! Fingers crossed they have this contact paper here. It's perfect for my decor! These tips to much helpful for party hope I am post for my friend These boxes aren't necessary as most movers will wrap your mattress in plastic bags which are much cheaper to purchase. However, boxes will keep your mattress from being punctured or if it's being stored for a while, it'll protect it better from outside forces. Mattress boxes come in many sizes from cribs to twin to king-size. Where I do I go Dollar Tree? I specifically went into Dollar Tree today to grab a random item because I am trying to do one review per week and realized I hadn't done one this week.